Lyme disease is just awful. In addition to being transmitted by disgusting blood sucking ticks, the disease signals its arrival with spreading, bullseye rashes. It often culminates in joint pain, headaches and other debilitating symptoms, and upwards of one person in five develops long-term symptoms, including chronic pain, vision problems and heart complications. The three-year, $345,750 grant from the National Institutes of Health will also support research opportunities for Bates students. But from a scientific perspective, Lyme disease is fascinating, as Bates chemistry professor Paula Schlax explains. The bacteria that causes it, Borrelia burgdorferi, is unlike any other organism she’s ever studied. “It has features and characteristics that are unlike most other bacteria,” Schlax says. Paula Schlax is a professor of chemistry. Schlax’s study of Borrelia, its genes and the “switches” that control them, has earned her a three-year, $345,750 grant from the National Institutes of Health — funding that will also support research opportunities for Bates students. The goal is to better understand how these switches work when the bacteria moves from a tick into a mammal, and from a mammal into a tick. Although antibiotics often succeed in treating the disease, more than half of Maine’s counties are at high risk for Lyme disease, which is spread by deer ticks. In Maine, 2014 was a record year for Lyme disease, with nearly 1,200 confirmed cases. The six New England states accounted for 35 percent of the nation’s confirmed cases of Lyme disease. Every year, roughly 30,000 Americans are confirmed as having been infected with the Borrelia bacteria. But because Lyme disease is often not reported or diagnosed, the actual number of infections could be 10 times higher than that, according to the Centers for Disease Control. Schlax started working with Borrelia when she received funding through Maine INBRE (IDeA Network of Biomedical Research Excellence) in 2009. The Maine INBRE award allowed her to focus on understanding gene regulation in Borrelia. The infection that causes Lyme disease is activated in the bacteria when it moves from tick to mammal. Understanding how those switches occur — or better yet, figuring out how to stop or alter them — could yield new treatments for Lyme disease, Schlax says. “The more we understand that, the more likely it is that someone else can use that information when thinking about ways to alter that transmission to make [the bacteria] less effective,” she says. Schlax’s research examines how the shape of an RNA molecule influences its ability to interact with other molecules in the bacterial cell. 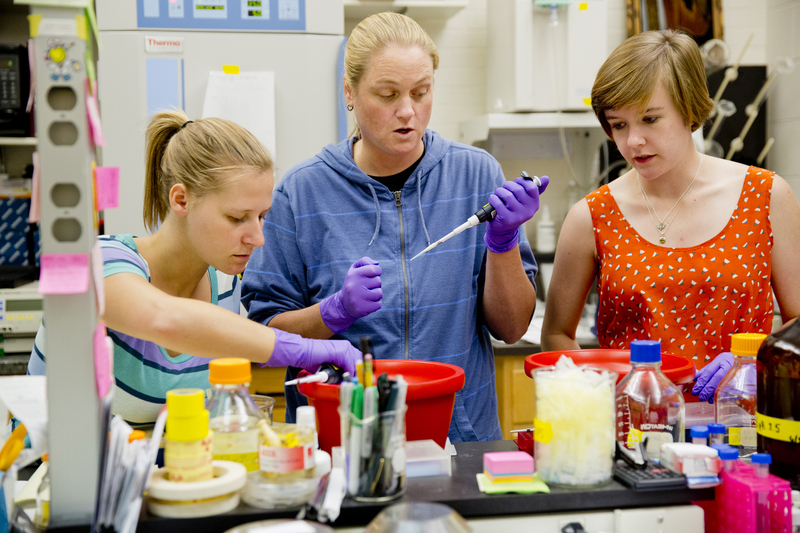 In her lab in Dana Chemistry Hall, she and her students will use the grant to monitor how fast Borrelia RNA gets broken down by enzymes called ribonucleases, important information to know when studying how to inhibit the bacteria. Using living cells, Schlax and her students add antibiotics to stop Borrelia from making new RNA. Then, at various intervals, they measure how much RNA has been broken down by the ribonucleases in host cells. The NIH grant will allow Schlax to hire a lab technician as well as fund paid summer research opportunities for as many as nine students over the life of the grant. In addition, three thesis students are currently working with Schlax on related research. Schlax has taught at Bates since 1998, and was promoted to full professor in August. She graduated from Clarkson University in 1989, and obtained a doctorate from the University of Wisconsin in 1994.